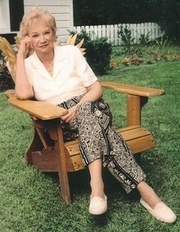 Kuczkir cowrote 26 novels with Roberta Anderson under the "Fern Michaels" name, but obtained all legal rights in 1989. Fern Michaels's book Breaking News was available from LibraryThing Early Reviewers. Fern Michaels's book Tuesday's Child was available from LibraryThing Early Reviewers. Fern Michaels's book Secret Santa was available from LibraryThing Member Giveaway. Fern Michaels's book Gotcha! was available from LibraryThing Member Giveaway. Fern Michaels's book Deadline: The Godmothers #4 was available from LibraryThing Member Giveaway. Fern Michaels's book Betrayal was available from LibraryThing Member Giveaway. Fern Michaels's book Southern Comfort was available from LibraryThing Member Giveaway. Fern Michaels is currently considered a "single author." If one or more works are by a distinct, homonymous authors, go ahead and split the author. Fern Michaels is composed of 9 names. You can examine and separate out names.